On April 25, 2006, at the age of 65, Mrs. Irma Thomas Jackson decided to trust her voice. After 46 years of professional recordings, Irma would release an album unlike any she had before. An album stripped down to the basics – no horns, no elaborate orchestrations. Only a few basic instruments, mostly acoustic, would support the album’s featured instrument – Irma’s voice. Simple, honest and unadorned. The album was called After the Rain. It won Irma the 2006 Grammy Award for Best Contemporary Blues Album. Singing has always mattered to Irma Thomas. Fired from her first two jobs for singing at work, Irma began singing professionally at age 19. Through good times and bad, Irma never considered any other career. Forty-six years later, Irma Thomas has no regrets – and neither do her thousands of grateful fans. One of our region’s most beloved personalities, Irma Thomas has developed a refined sense of priorities – such as her family (including 15 grand and 7 great-grandchildren); her education (she received her college degree from Delgado in 2003); her community (rebuilding her New Orleans home after Katrina was never a question) and most importantly…her glorious voice. Irma demonstrates that one of the great joys of maturing is the comfort we can achieve with ourselves. Liberated from youth’s insecurity, we abandon our tireless quest for validation. Self-image transforms from how others see us to how we see ourselves. Confident and content with the person we have become, we can focus on the things that really matter. It is time and experience that give us that confidence. 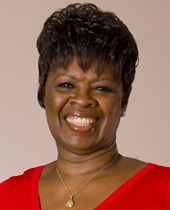 Mature, confident and proud – Irma Thomas is a Peoples Health Champion.